Collaborative pairings often bring a frisson of excitement in the world of music production, particularly when an established artist and comparative newcomer join forces. 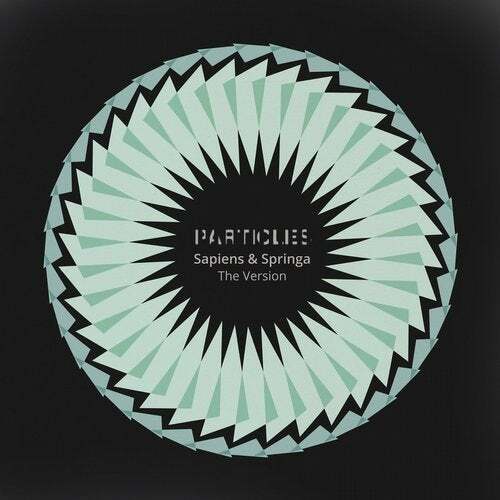 "The Version" EP from Sapiens and Springa brings that thrill to Particles. From the Bauhaus inspired buildings of the 1930s on the Mediterranean coastline, Tel Aviv resident, Alon Shapiro, has been immersed within the culture of music, spending a decade honing his production persona. Now debuting that production talent through his Sapiens moniker, the Israeli producer builds upon recent success. Trained in classical piano from an early age, a subsequent vinyl addiction and the joy of music stemming from the art of the 'mixtape', Sapiens found an eclectic passion for "intelligent, underground genres" ultimately distilled into a love of pioneering electronic that included Jean Michel Jarre, Kraftwerk and The Orb. Academic studies in music production followed as did gigs at local clubs and venues in the mid 2000s before the Sapiens name took hold in 2006. A portfolio of work has subsequently flowed leading to work signed for Baroque, Suffused Music and Stellar Fountain. Although the name Springa has an outward appearance of a newcomer to the underground dance movement, Mattias Lindblom is a name firmly entrenched in the modern music industry through an integral part played in the Swedish outfit, Inkfish. A man of incomparable production pedigree, Lindblom has seen his work signed to a vast collection of blue chip labels including over 250 signed to Inkfish's own successful, eponymously named imprint. Launching the Springa production alter ego through a remix of Mistol Team for Baroque in 2014, 2015 has proved a successful year for Lindblom as Springa has seen further work signed for Mistique Music and Pangea. Furthermore work for System Recordings including a remix of Sapiens himself, set the duo up for exciting collaborative work that now manifests itself fully in "The Version". An EP arranged into two distinct halves, "Introversion" and "Extroversion" supply a pair of opening salvos wrapped around a common percussive narrative and musical themes. "Introversion" opens proceedings with a metronomic bass line that fires off the rhythmic section with intelligence while a series of musical motifs, riffs and stabs provide an elegant contribution. A driving, pulsating affair, "Extroversion" quickly finds its feet with a spine-tingling bass line progression that dominates the melodic direction. A clever vocal cut weaves its way in and out in a variety of guises that are reminiscent of classic progressive house tunes of yesteryear to crate an aura of intrigue and nostalgia. Taking vocal cues from its "Extroversion" counterpart, "April Heart" continues the bass line dominance of its predecessor as it growls and filters its way over the opening movements in emotive fashion. Evolving purposefully in the breakdown and beyond, a delicious arpeggio riff opens up the upper frequency spectrum with delightful fashion to create a driving, vibrant work. A stripped back "Dub Mix" minus the vocal component completes an impressive picture. A quartet of tracks from Sapiens and Springa demonstrates a striking common purpose through "The Version".